One of my favourite online plus size retailers, ELOQUII, recently sent me a pair of their famed plus size pants called the ‘Kady Pant‘. I have seen then promoting this pant for quite some time now and was excited to try out my first pair and review them for you. I personally don’t wear pants on the regular, as most of you know I am a dress girl and when dress season is over I can usually be found in leggings, but that aside I was still excited to try the Kady Pant. As I say, when you step out of your comfort level (especially when it comes to fashion) you may be surprised at what you find! Now, I think I could have used a size smaller in the pants as they were slightly baggy but overall I was VERY impressed with the fit. They were the perfect length (I am 5’9″) and I enjoyed the straight cut of the pants. I also tend to hate when pants cut into my mid drift – I find that irritatingly painful which is why I shy away from wearing pants all day but these ones were quite comfortable on top! All-in-all I can see why ELOQUII has over 25+ different patterns and colours in the Kady Pant for sale on their website! I now need the Kady Pant in a classic black and in one of the pretty floral prints to expand my new collection! I have paired the Kady Pants with a top that I ironically just purchased from ELOQUII called the Harding Sweater, it is the perfect long-sleeved knit sweater for the colder days that you still want to look cute on! It flares out at the bottom giving it a more feminine feel than just a plane old black sweater. The flare is also perfect for hiding any wobbly bits that you want keep at bay. This sweater comes in black, red, green and red. 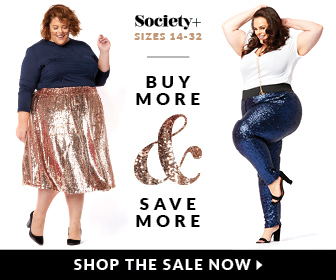 One last tip, ELOQUII always has fabulous sales so keep an eye on their website to find a great deal – currently they are offering 40% off your purchase with a $100 purchase – use code SAVE40.